FISSION 500 | Shannon Boats. Boat Builder in Taree. See details on the Fission 500, Kayaks and Pulling Boats. Had an awesome time aboard the FISSION 500 catching bass on Lake Glenbawn. Heading back for another weeks fishing in November. 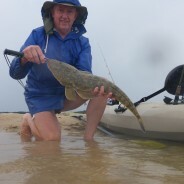 Fished the southern entrance of the Manning river from my kayak recently chasing Flathead on soft plastics. (Mainly 5″ jerk shads). The Flatties were hammering the lures in the fast flowing water right in the Old Bar entrance. Hits nearly every cast. Caught and released heaps of fish but took home a dozen fillets. Delicious! Photo enclosed of one of the released fish.